Bognor first team coach Robbie Blake is urging the club to take one game at a time as the Rocks’ distant playoff hopes remain well and truly alive. With five matches to play, the Nyewood Lane side sit ninth in the Bostik Premier, six points off the top five. A 2-0 win against the ten men of Wingate & Finchley last weekend – the club’s first victory in six league matches – has certainly lifted the mood in the Rocks camp. But with matches running out fast, Bognor will need to keep that winning feeling going at home against Brightlingsea Regent tomorrow (3pm). Claim three points and an unlikely place in the playoffs continues to be a possibility. Speaking after the Wingate win, Blake said: “It’s certainly by no means an easy assignment but if we win tomorrow we’ll see what happens. “We have to take one game at a time, you never know what will happen . Blake and manager Jack Pearce will be looking for their young side to give fans something to cheer against the Essex side tomorrow. Regular visitors to the Nye Camp this season will know how much the club have struggled in front of their own supporters. 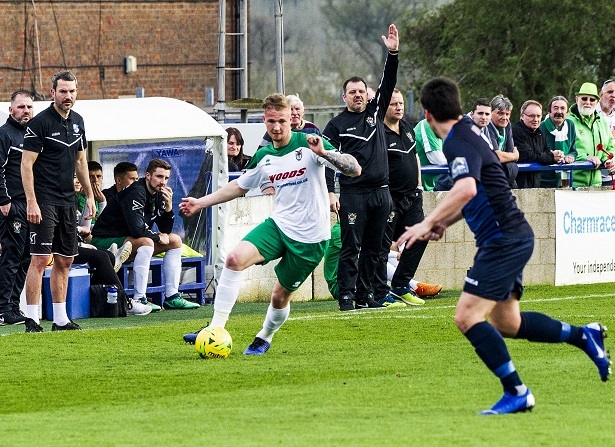 Of the 18 home league games so far, Bognor have won seven and drawn five – the worst home record of any club in the top half of the Bostik Premier which has hampered any hopes of an immediate return to step two of the non-league pyramid. Blake said: “It will be a tough game, every game in this league is tough. A midweek Sussex Senior Cup semi final against Brighton & Hove Albion Under 23s on Tuesday (7.15pm) at Lancing’s Culver Road makes this a pivotal week for the club. Win and a final against league rivals Burgess Hill awaits.